One always hears that sooner rather than later, artificial intelligence will win the battle over humanity. People will become unnecessary, robots will rule the earth and humankind will vanish with a flicker of a dying match. It’s true. I read all sorts of articles from many sources that discuss both sides of the issue. Many valid arguments from both sides. However, I can’t get past one thing: humans build these things, don’t they? Not machines, but flesh-and-blood types, the kind that need air to breathe and run on food instead of…well…whatever it is that AI runs on. To be honestly, I’ve yet to see a real valid example of a machine building a machine smarter than it. In fact, I’ve yet to see any sci-fi out there regarding a droid, robot, gizmimee or quelnodder, screwdriver in hand, lifting the lid off of the head, chest and guts of a counterpart, carefully placing a chip inside and closing it up, then miraculously watching that God moment when all becomes too real and rises up to become the conquerer of the universe. Droids/Robots constructing improved units also presents another item for discussion: why would it? What does a D/R have to gain by creating an improved version of itself? That improved version might notice its creater’s a bit dimmer than it, find the kill switch and be done with it. True. that can be part of the program and if the God D/R had any sense, it might write a code that includes a directive a al “I, Robot”, in that “do no harm” is a real and true order. Even that statement up for interpretation. If the God robot wants to kill its progeny, it’s preserving its own life with the successive, smarter D/R catches on that it has one chip up on its Daddy. Bearing this in mind, why would a person create an object than can outsmart us? Frankly, humans are too clever for their own good to do this. First of all, we’re competitive. Egos are sensitive enough as it is. Some of you might remember Garry Kasparov losing to IBM’s Deep Blue, after beating it previously. He didn’t take it well at all. And then there’s that “Jeopardy” match with mere mortals. Although that took some doing, again, people got the short end of the stick. 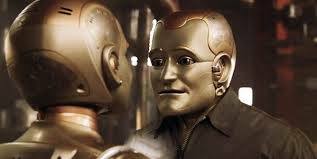 Of course, we all know that drink was expertly served by none of than Bob the Botender, programmed to sympathetically listen to life’s ups and downs, collect tips and cut you off when you’ve had a few.